Last season, just four tight ends had at least 800 receiving yards, but five had at least eight touchdown catches. This contributed to seven tight ends finishing the year with at least 100 total fantasy points, including two who averaged under 34 yards per game! Because such a disproportionate number of tight end fantasy points are scored through touchdown catches, choosing a tight end in fantasy football often becomes a bit tricky. It is difficult to predict when your tight end will be the beneficiary of an easy touchdown pass that resulted from a runner being tackled at the one-yard line the play before. It is still best in most situations to target, well, targets. Tight ends who are a focal point of their team’s passing offense are the preferred fantasy options in most instances. With this in mind, let’s take a look at my current top 10 tight ends for 2018. Despite rumors of retirement and the increasingly long list of injuries Rob Gronkowski has suffered throughout his career, he still sets the standard for tight end fantasy production. He led the position in fantasy points once again last season despite missing two games and going untargeted in New England’s regular-season finale. His 1,084 receiving yards led tight ends and ranked 10th among all players last season. 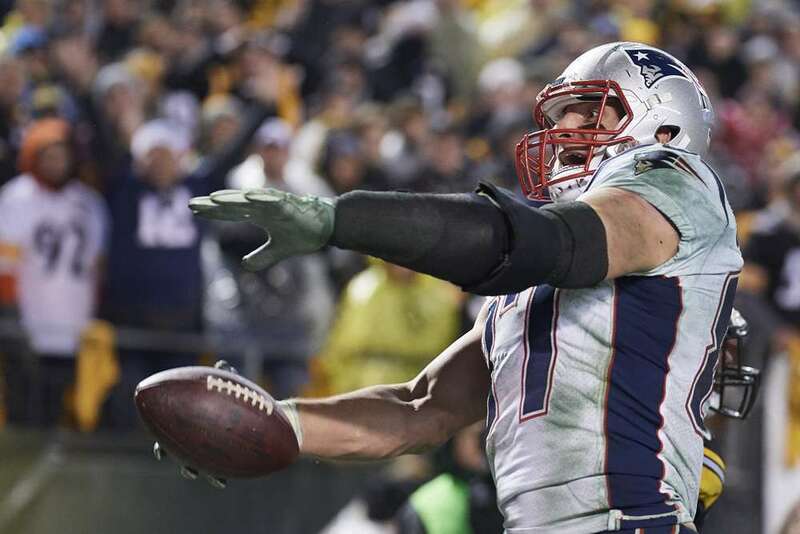 Gronk is a threat to post double-digit fantasy points every week he steps onto the field. Last season, he finished as a top-four fantasy tight end an incredible eight times. Simply put, no other tight end has Gronkowski’s ceiling. The injury risk is there, but the rewards are enormous if he can stay on the field. He comes at a slight discount this season and can be had in many instances in the third round in drafts. Gronkowski once again heads the list of my Top 10 tight ends in 2018. Travis Kelce has improved his yearly fantasy output and has never finished outside the top-six in fantasy scoring in each of his four NFL seasons. Unlike Gronkowski, Kelce has been incredibly durable, having never missed a game due to injury. He posted his second consecutive 1,000-yard season last year and scored a career-high eight touchdowns. He should continue to provide top-end production in 2018 as well. It will be interesting to see if Kansas City’s offseason moves will influence Kelce’s production. Offensive coordinator Matt Nagy left Kansas City to become the head coach of the Chicago Bears. Kansas City signed free-agent wide receiver Sammy Watkins to complement Tyreek Hill on the outside and traded starting quarterback Alex Smith, signaling the beginning of the Patrick Mahomes era. Ultimately, I do not think Kelce’s outlook changes much. He will still be a highly-targeted player in what is a potentially lethal scoring offense. Perhaps no player had as consistent a fantasy season in 2017 as Zach Ertz. Ertz finished as a top-eight tight end in 11 of 14 contests last year. That number is even more impressive when you look at the three games he failed to reach that mark. In Week 11, he was returning from a hamstring injury and may not have been playing at 100 percent. In Week 13, he left the game early after suffering a concussion, and he left a meaningless Week 17 game early in the second quarter to rest. Essentially, every time Ertz played a full game at relative health, he performed on an elite level. Ertz would likely be ahead of Kelce on this list if he were more of a seam stretcher. He only has an aDOT (average depth of target) of 8.00 in two seasons alongside quarterback Carson Wentz and under head coach Doug Pederson. If the Eagles decide to use Ertz down the field more, he could easily wind up as this season’s overall TE1. However, he will no longer come at the discount he did in the past. An eighth-round fantasy pick in 2017, Ertz is now going in the third round in many Fantrax drafts. I think many fantasy players are sleeping on Greg Olsen this season. He is currently being taken as the sixth tight end off the board in most drafts and his ADP is a full round behind Evan Engram. Perhaps there is concern over the broken foot that rendered Olsen ineffective throughout 2017. Or maybe the rumors of him leaving the game for a career in the booth have people questioning his desire. But Olsen has dominated the fantasy ranks at the tight end position for nearly a decade. Prior to last season, the last time Olsen finished a year outside of the top-three in fantasy scoring among tight ends was 2011. From 2014 through 2016, Olsen became the only tight end in NFL history to record at least 1,000 yards receiving in three consecutive seasons. Olsen is Cam Newton’s security blanket, and that will remain the case as Newton tries to get acclimated to so many new faces in the huddle. I expect Olsen to be leaned on heavily once again, and I believe he will approach 1,000 yards and return to his usal place in the Top 10 tight ends of 2018. Jimmy Graham is a bit of a wildcard for fantasy purposes. He has finished as the overall TE4 in back-to-back years but has done so in completely different manners. In 2016, he finished with 923 receiving yards, which ranked third at the position. He had at least 40 yards in 12 of 16 games and ended that season with six touchdown catches. Last year, he finished just 15th in receiving yards among tight ends and had only six games of at least 40 yards. However, he reeled in 10 touchdown catches which led all tight ends and tied him with current teammate Davante Adams for the second-most in all of football. In most cases, the uptick in touchdowns might be unsustainable, but I do not worry about that in Graham’s case. Graham has made a career of scoring touchdowns, as 2017 was his fourth season posting at least 10 scores. The move to Green Bay should also be seen as a positive. Aaron Rodgers is always a threat to lead the league in touchdown throws, and Graham should continue to be a weapon in the red zone, particularly with the absence of Jordy Nelson. Graham led all players with 26 red-zone targets last season and may reach that number again this season. I think the days of Jimmy Graham approaching 1,000 yards receiving and double-digit touchdowns are over, but as long as he can reach either one of those thresholds, he should record another top-five fantasy finish. Delanie Walker may not have tremendous upside as he enters his age-34 season, but he has remained a consistent fantasy performer throughout his tenure in Tennessee. He has finished as a TE1 in each of his five seasons as a Titan and has been targeted at least 100 times in each of quarterback Marcus Mariota’s three years. Mariota should continue to look for Walker in 2018, as Tennessee’s wide receiver corps is not a strength. Walker only caught three touchdowns last year but had at least 60 receiving yards in half of his games last season. That level of weekly production will often offset a lack of scoring. Of course, there is also the possibility that last season’s touchdown total was at the low end of Walker’s range of outcomes. Walker had averaged 5.75 touchdowns in his previous four seasons in Tennessee. A five or six-touchdown season in 2018 would likely lead to Walker approaching top-five fantasy status. Your league-mates may not sing your praises or offer you kudos when you select Walker in the seventh round of your draft, but he should continue to remain a solid contributor and a consistent weekly fantasy asset. Evan Engram finished fifth among all tight ends with 722 receiving yards and 109.60 fantasy points in 2017. His rookie campaign provided a glimpse into the future, as Engram is one of the offensive cornerstones of a young group of ball handlers and catchers alongside veteran Eli Manning in New York. Despite Engram’s massive potential, I am a bit worried that he takes a slight step back in 2018. Most of Engram’s 2017 output came out of necessity due to an injury-wracked receiving corps. This is no fault of his, of course, but his 19.8 percent target share is likely to dip with Odell Beckham and Sterling Shepard healthy. Rookie running back Saquon Barkley also figures to be heavily involved in the Giants’ offense. Last season, Engram was targeted at least seven times in 11 of 15 games. I just do not see that consistently high volume being the norm this season. He is still a starting fantasy tight end and will put up some big weeks, but I think his stats among the top 10 tight ends is in danger. Like Jimmy Graham, Kyle Rudolph did not post great yardage totals but benefited in 2017 from catching a high number (eight, to be exact) of touchdown passes. Rudolph was not heavily targeted last year, as he was on the receiving end of just 81 throws. However, the former second-round pick from Notre Dame should put up good fantasy numbers once again this season. The Vikings have one of the most dynamic wide receiving duos in all of football with Adam Thielen and Stefon Diggs. Having threats like that on the outside should open up room for Rudolph to operate over the middle. The signing of free agent quarterback Kirk Cousins should also keep Rudolph afloat. Cousins has often taken care of his tight ends, and I expect Rudolph to continue to post TE1 numbers with Cousins at the helm. I do not expect Rudolph to put up another top-six season, but he makes for a fine second-tier option in fantasy leagues. Under most circumstances, a player with a career 63-629-6 line would only make a list like this if he were a rookie like Evan Engram. In fact, Engram’s 64-722-6 line exceeds the total production that Trey Burton has accumulated in four NFL seasons. So why is Burton such a sought-after commodity in fantasy heading into 2018? The answer is twofold. First, Burton signed with the Chicago Bears in free agency, giving him an opportunity to step out from beyond the massive shadow of Zach Ertz. Secondly and perhaps more importantly, Burton will be paired with new head coach Matt Nagy. Nagy was instrumental in the development of Travis Kelce, and has already stated that he expects Burton to play Kelce’s role in Chicago’s scheme. Nagy would not have signed off on Burton’s contract if he wasn’t fully confident that Burton will be up to the task. Burton is an excellent athlete and the Bears believe he will create mismatches down the field. Burton may not put up the top-five fantasy numbers that we have gotten accustomed to from Kelce right away, but he should be a bona fide fantasy starter this season. We all know that Jordan Reed has the talent to be a high-upside tight end in fantasy, as evidenced by his 2015 campaign which saw him average an incredible 11.23 fantasy points per game. We also know that his durability is suspect (to put it nicely) and that he is a bad hit away from possibly calling it a career. The decision on whether or not to draft Reed essentially comes down to your threshold for risk management. Reed could be a huge bargain this season, or you might be looking for a permanent replacement by Week 4. If Reed can play just 12 or 13 games, he should end up as one of the top 10 tight ends, as was the case as recently as 2016. This upside is enough for me to consider him a back-end TE1. Once you get into the low-TE1 range, all of the tight ends have some question marks regarding their year-long potential. Some are injury risks. Others have concerns about their playing time and role within their team’s offense. There are enough streamer tight ends out there that make drafting Reed worth the risk in my estimation. If and when he goes down, you should be able to find a serviceable replacement on the waiver wire to step in.